Daniel E. “Denny” Hartzog, 76, passed away peacefully at his home on Thursday, March 14, 2019 surrounded by his loving family. Denny was born on May 9, 1942 in Hilda SC and was a son of the late George E. and Mary Ellen Collins Hartzog. He was a graduate of Blackville High School and was a member of Double Pond Baptist Church where he served as a deacon and was instrumental in the construction of the church fellowship hall. He had served in the SC National Guard, was a former member of the Hilda Fire Department and the Hilda Fellowship CB Club. 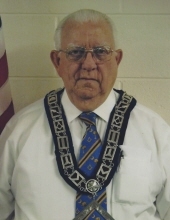 He was Past Master of the Hilda Masonic Lodge #426, Omar Shrine Temple, El Bab Shrine Club, the Square and Compass Club and The York Rite.He began his construction career with his father building houses and retired from GMK Associates as Project Manager. Funeral services will be held on Sunday, March 17, 2019 at 3 pm in the Double Pond Baptist Church with Dr. Thomas Terry and Rev. Donnie Delk officiating. Burial will follow in the Hilda Southern Methodist Church Cemetery with Masonic Rites accorded. Visitation will be from 6-8 pm Saturday, March 16,2019 at Mole Funeral Home. Memorials may be made to the Double Pond Baptist Church, Hilda Southern Methodist Church Cemetery Fund and The Shriners Hospital for Children, 950 Faris Rd, Greenville, SC 29605. Please mark your envelope MEMORIALS. Survivors include his daughters and sons in law, Wendy and Ski Hooper of Barnwell, Christina and Mark Odom of Hilda, brother, Edgar A.. Hartzog of Hilda; sister and brother in law, Connie and Wilbur Peterson of Valdosta Ga.; grandchildren, Wayne Hutto, Sarah Hooper and Skyler Hooper and great grandson, Connor Hutto. He was predeceased by his loving wife, Cheryl Delk Hartzog and a son, Terry Hartzog. To send flowers or a remembrance gift to the family of Daniel E. "Denny" Hartzog, please visit our Tribute Store. "Email Address" would like to share the life celebration of Daniel E. "Denny" Hartzog. Click on the "link" to go to share a favorite memory or leave a condolence message for the family.